So when my ToDo list is completely out of control what do I spend time doing? A tribute to That dress from "Breakfast at Tiffany's". 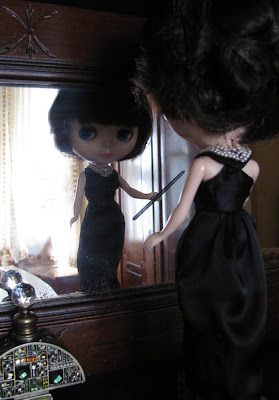 My new Blythe doll is called Audrey - she doesn't like the idea of a cigarette holder and tells me that it is actually a magic wand. I'm not telling her that it is really a broken paint-brush! Though I have a great many 'issues' with the story-line of B@T's, Audrey Hepburn looked completely gorgeous in those Givenchy dresses. I had fun getting the cut-away back looking similar - though it created problems with fastening - snap-studs are quite bulky on the tiny scale of dolly dresses. Audrey Hepburn's pearls etc were a separate necklace - for convenience I've sewn Audrey's to the dress.